In September 2001, the then Minister for Environment and Heritage, Senator Robert Hill, and Senator Nick Minchin released a joint press release regarding an action agenda to assist the environment industry to reach a target of $40bn in annual sales by 2011. In 2008, this action agenda is more than halfway through and the environment industry continues to show strong growth as it moves towards this target. The understanding that environmental issues present business with more of an opportunity than a compliance cost, as well as the increase in environment protection legislation, has helped to drive this industry forward. The spill control sector is an important part of the overall industry and a critical segment of any organisation’s environment protection strategy but remains largely unregulated. In this unregulated environment, there are 4 important questions that consumers need to ask when buying spill control equipment to ensure due diligence is being exercised. Why is spill control equipment needed? “A person must not carry out any activity that causes, or is likely to cause, environmental harm unless the person takes all reasonable and practicable measures to prevent or minimise the harm”. If a pollution incident occurs and the responsible company is unable to provide evidence that the General Environmental Duty has been observed, maximum penalties of up to $5 million and 7 years imprisonment are available to the courts. How much spill control equipment is needed? Section 2.3.4 (Spillage Control) of The Australian Standard AS1940-2004 for the storage and handling of flammable and combustible liquids states that all spills and leaks shall be cleaned up immediately. Liquids should not be allowed to flow into drains or onto neighbouring land, or enter any creek, pond or waterway. Mobile bins are a common spill kit container but the size of the container that a spill kit is packed into does not reflect its ability to absorb a certain amount. 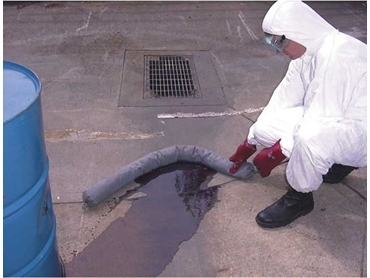 Always ask the spill control provider what the absorbent capacity of the spill kit is. It is important that the supplier can support these claims by providing a copy of maximum sorbency testing results from an accredited laboratory. The Department of Environment and Climate Change (DECC) conducted compliance audits on 52 licensed management facilities and 10 non-licensed premises that store and handle liquid chemicals and manage spills. As with all emergency response equipment, staff must be trained in correct deployment in the event of an incident occurring. As well as providing a thorough understanding of how to correctly use the on-site spill control equipment, the training should also make staff aware of how the legislation applies to both them and the company. This is critical as there are responsibilities and liabilities carried by both individuals and the site occupier and ignorance of the law is no excuse. Due diligence requires spill control suppliers to include complete product training to assist with achieving ideal environmental outcomes. How are used absorbents to be disposed? Whenever waste is generated, it must be deposited into the correct waste stream. The type of liquids absorbed and the amount of contaminated absorbents will determine the waste stream into which the used absorbents must be disposed of. All states, apart from Northern Territory, provide documented waste disposal guidelines to ensure correct disposal of oil soaked waste. There are slight differences in these guidelines from state to state. The common principals shared by these guidelines are up to 100kg of oil soaked waste can be disposed of as solid or inert waste provided that there are no free liquids present. The test method required by these guidelines to show that there are no free liquids is the USEPA Paint Filter Liquids Test – Method 9095A. Ask the spill control provider to supply the document that establishes that the absorbents they offer meet this requirement. If they are unable to provide this documentation, the consumer may be vulnerable to prosecution for illegal dumping of waste. The DECC issued a document entitled general approval of the immobilisation of contaminants in waste. This document sets out the requirements that must be met in order for general hydrocarbons (C10-C36) to be disposed of as inert or solid waste. One of the requirements of this disposal method is that the absorbent used must be capable of securely containing more that 100% of their own mass of such hydrocarbons. This means that 1kg of absorbent must be able to securely absorb 1kg of oil. Currently there is no commercially available kitty litter style absorbent that is able to meet this requirement. Consumers should be aware that if they dispose of oil soaked absorbents as inert or solid waste that do not meet the DECC requirements, they may be liable to prosecution for illegal dumping of waste. Regardless of what bacteria or enzyme is added to the absorbent, disposal of waste in any method other that what is stated in the guidelines is an offence. By asking the spill control provider these 4 important questions it can be made sure that due diligence is being exercised and that the correct tools for effectively addressing an emergency spill incident are on hand.